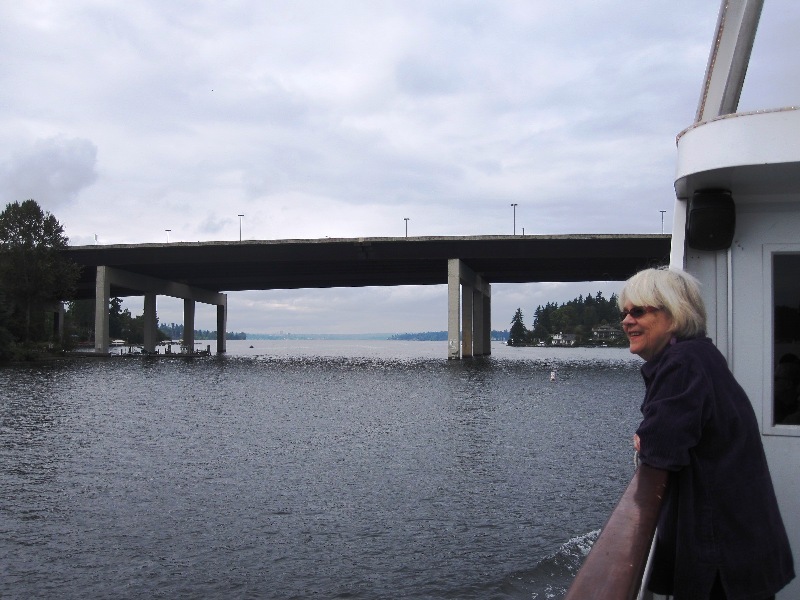 A little while back I received an early birthday present of a cruise on Lake Washington. Being new to the area I enjoyed taking in the sights from a different vantage point. It was a gray and cloudy day. 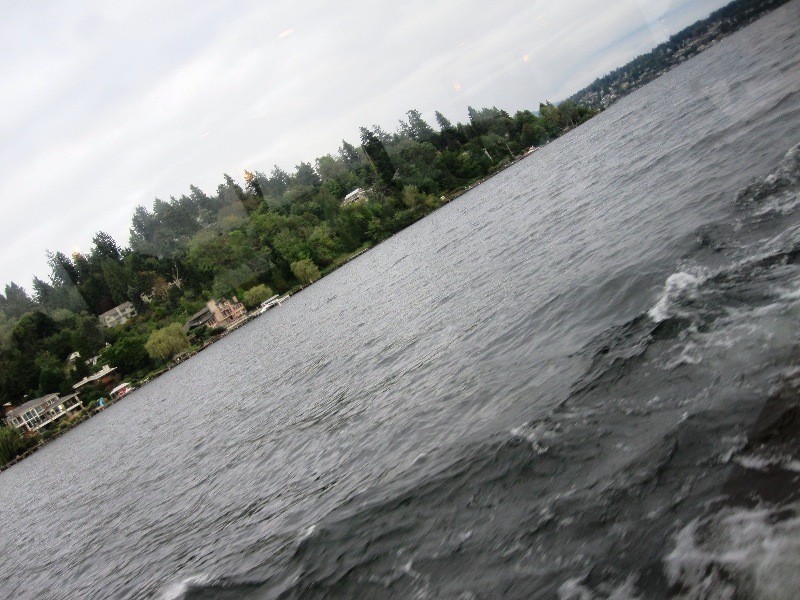 Wait a minute, I learned from our Captain that Seattle doesn’t have gray days. We enjoy silver skys! Actually I have noticed a difference in the clouds from Maine to Washington. The clouds are a definite silver color here unlike the very white clouds in Maine. 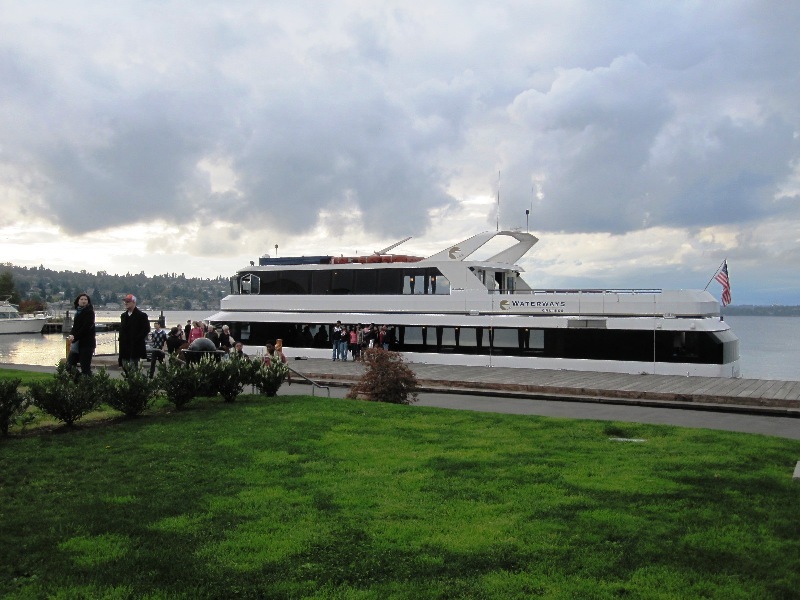 Our vessel, Emerald Star, circumnavigated, how do you like that sailing lingo, Mercer Island on a two-hour cruise. No one was shipwrecked, although I did meet a professor. You could sit outside on the deck, it was comfortably warm despite the sky, or you could find a seat inside. Either way you could enjoy appetizers, sandwiches and drinks. The captain kept a running monologue of local sites and historical information that was both amusing and educational. 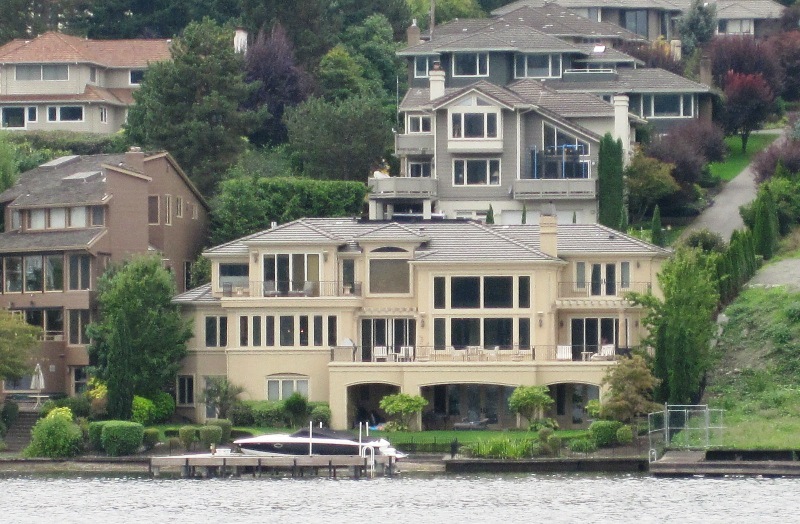 Of course there were plenty of fancy houses to see. And it was fun to see the underside of I-90. I know. I am easily amused. 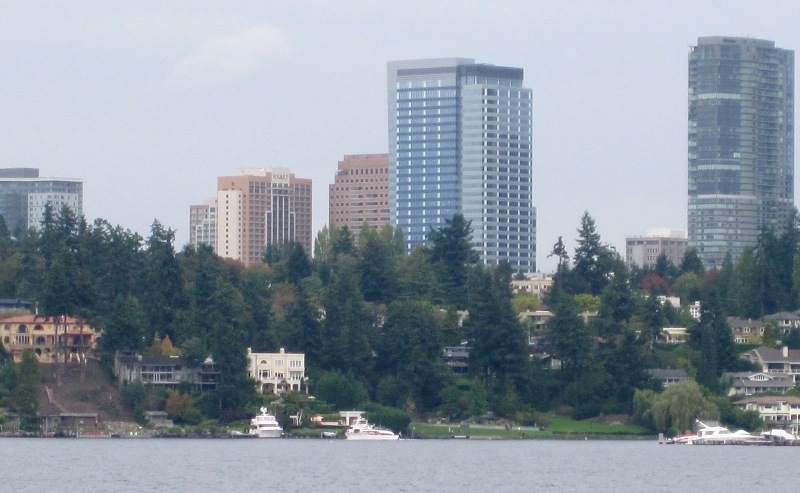 We saw Bellevue from a new perspective. 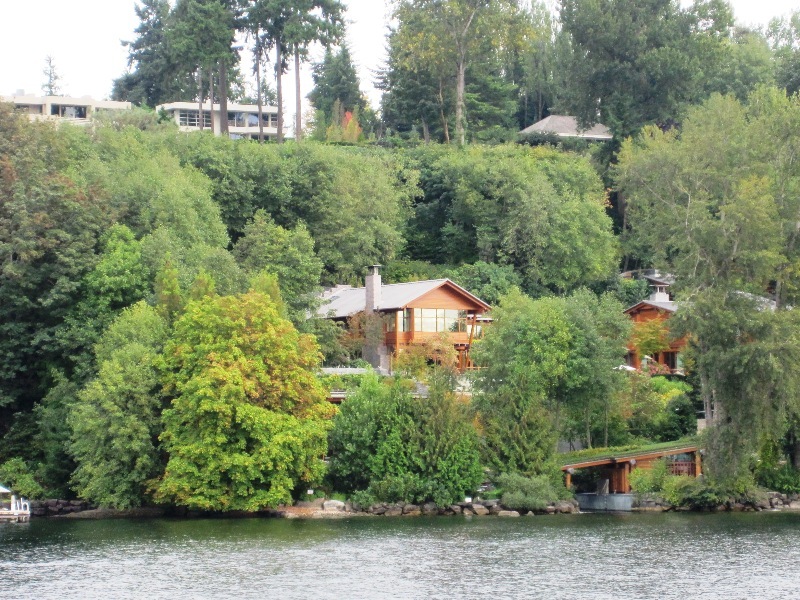 Bill Gates wasn’t home but here is his house. There was one family that spent most of the time taking pictures of themselves. 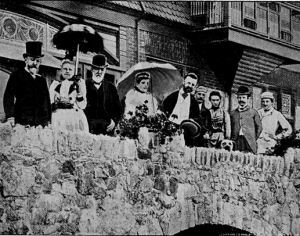 Families with small children tried to keep them from falling overboard. They were all successful. And the rest of us just enjoyed the ride. My week in Maine is almost at an end. Please don’t ask me how my vacation was. 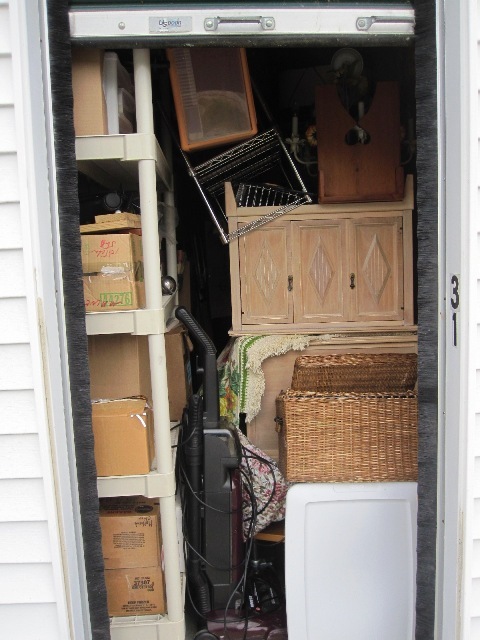 I spent every day working either in performances of Muse of Fire or trying to consolidate two storage units into one. I report that both of these endevors were successful. But building and striking sets, loading sets in and out and then moving boxes and furniture back and forth has me feeling kind of tired. The week was not without a little fun though. I was hosted during my stay by good friends who provided good conversation and tasty meals in addition to a comfy bed. I visited with folks I hadn’t seen in months. 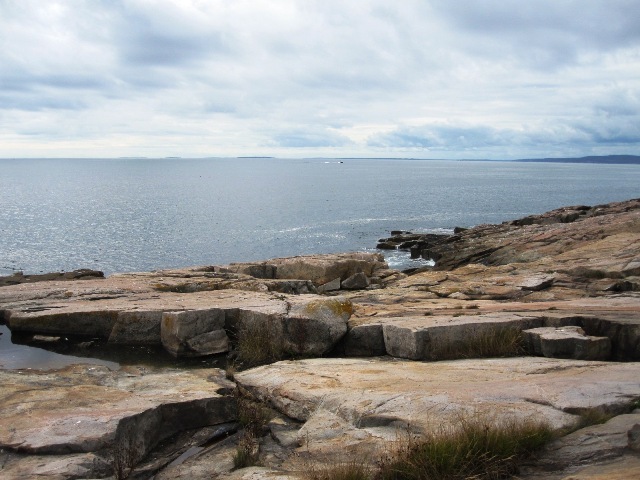 There was the obligatory visit to Schoodic Point, part of Acadia National Park-my favorite place in the world. 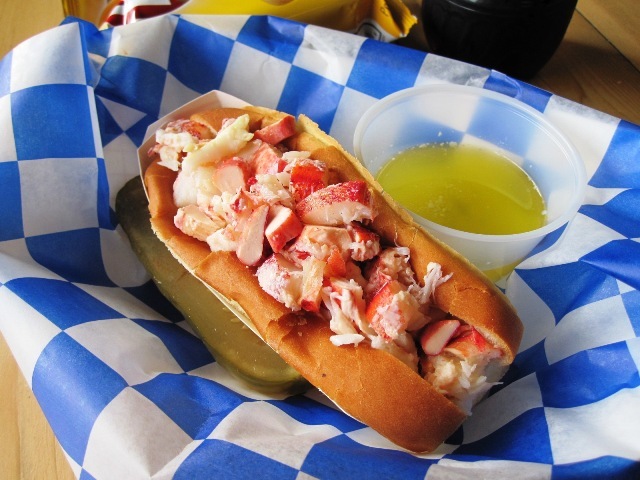 And of course, Lobster Rolls. The performances of Muse of Fire are a highlight of my year. The audience members once again rose to their feet in a spontaneous Standing O. That is always gratifying as this is not only a tremendous piece of theater but also an effort of the heart. The most beautiful day was, of course, the day I had to spend indoors. Warm and sunny with a searingly blue sky. The clouds must have felt sorry for me. 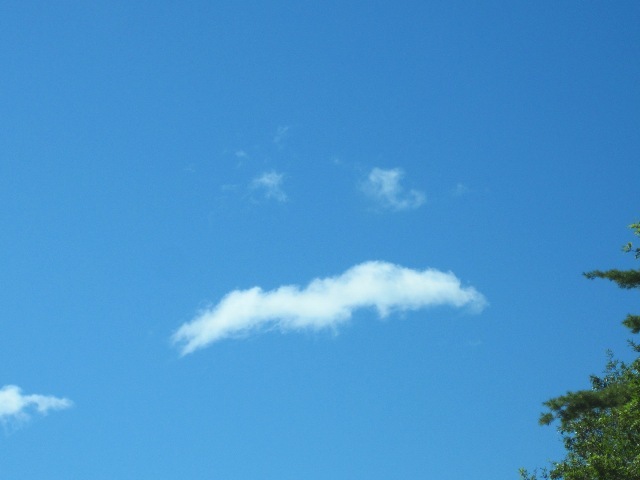 Take a look at this sad cloud face. 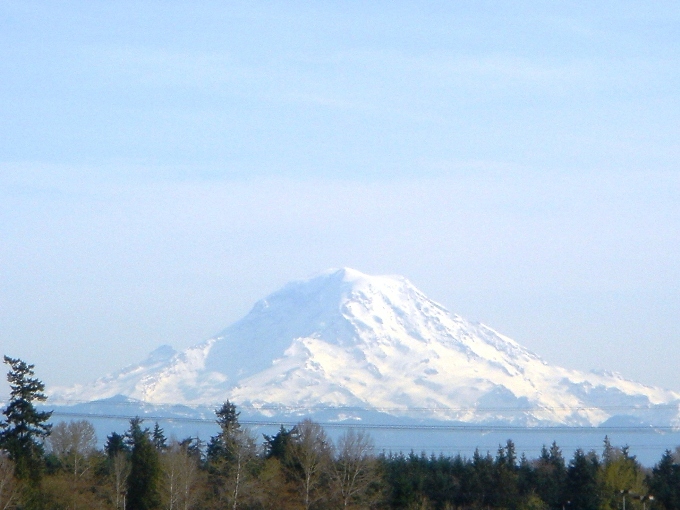 The rest of the week was cloudy with sunny breaks, as they would say back in Seattle. But I did not mind at all.The cool damp air felt really soothing to me. And I love the dark nights with bright stars and the quiet. Tomorrow packing and sorting the things I want to bring back with me. I have to admit I am not in London but you can sing that old standard if you want to while looking at these misty photos. It hasn’t rained in Seattle in days. I find myself longing for the cool, misty fog. A nice, cozy fog of the kind that gives you permission to stay home, read a book and enjoy a steaming beverage. 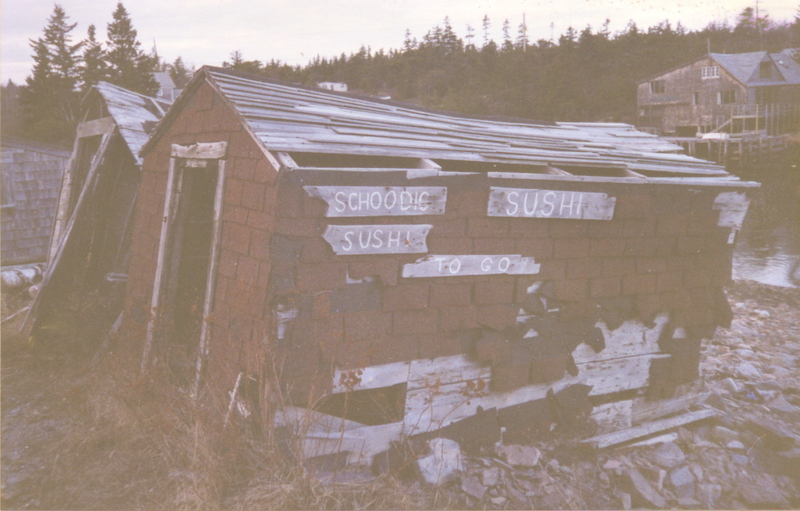 This is one of my favorite spots, just as you exit the Schoodic section of Acadia National Park. 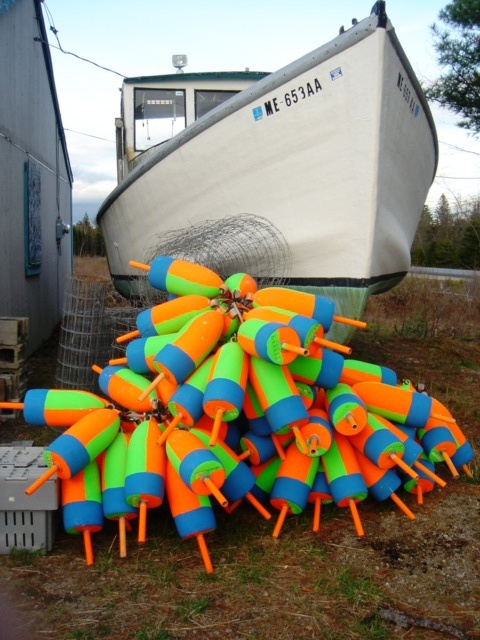 Never say that lobstermen haven’t a sense of humor. 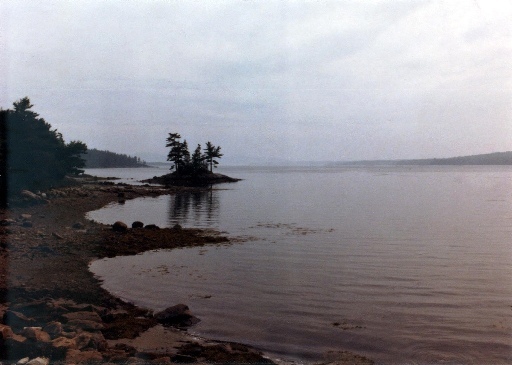 It was a misty kind of day when I was driving along Route 1 to Caribou, Maine. 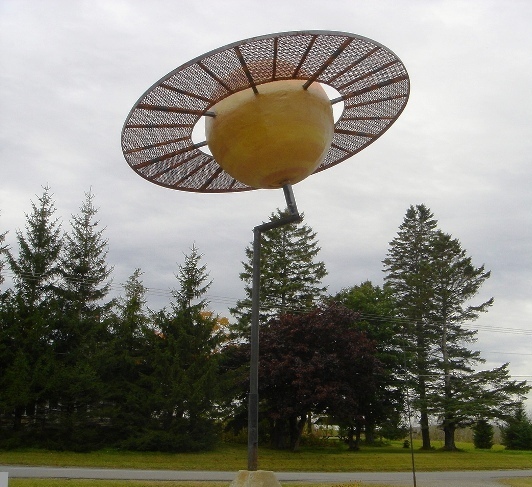 There is a scale model of the solar system along the road. Here is Saturn. If you are ever in the area make sure to check it out. This little island is precious. I used to see it everyday as I went about on my business. It is especially beautiful in the fog. If you want to see more foggy photos go and visit my friend at Fearless Nesting and view her fog chaser post. Rusticating in Bar Harbor. That’s what they used to do back in the 1800’s, get away from the big cities of New York, Boston and Philadelphia and come to Maine to vacation. People are still rusticating but it is much less formal than back in the day. 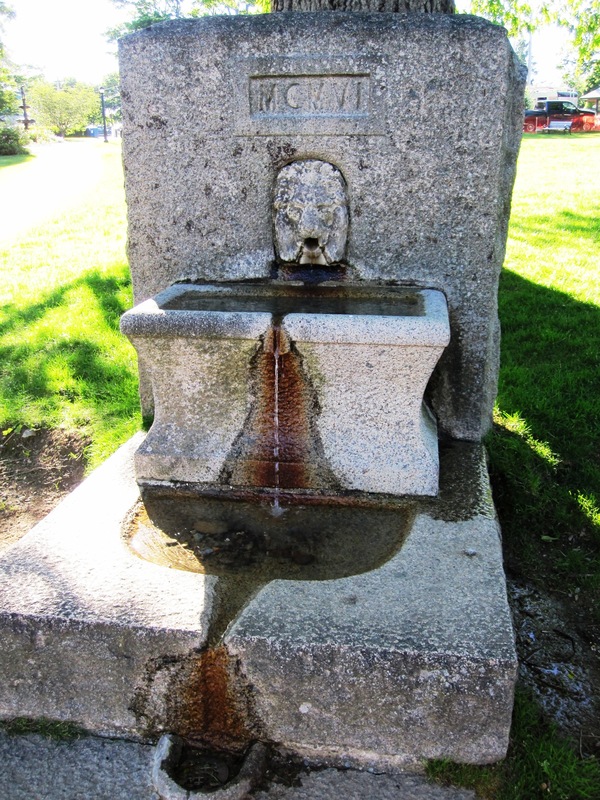 I wanted to show you some of the fountains in town. The first two are in the town park at the top of the hill. 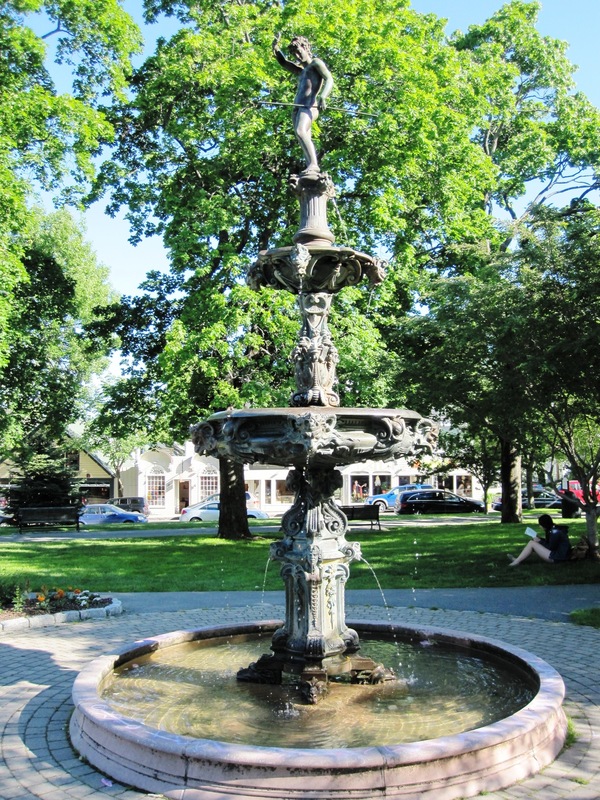 A sward of green with mature trees sporting a bandstand (with band concerts in the summer) is the site of this delicate fountain. I’m not sure who the handsome youth is that stands atop with his spear. But it is a most pleasing sight. On the other side of the park is the lion headed horse trough. No horses to be seen these days but I am glad they kept it in the recent park renovation. Across from the park is Butterfield’s grocery. 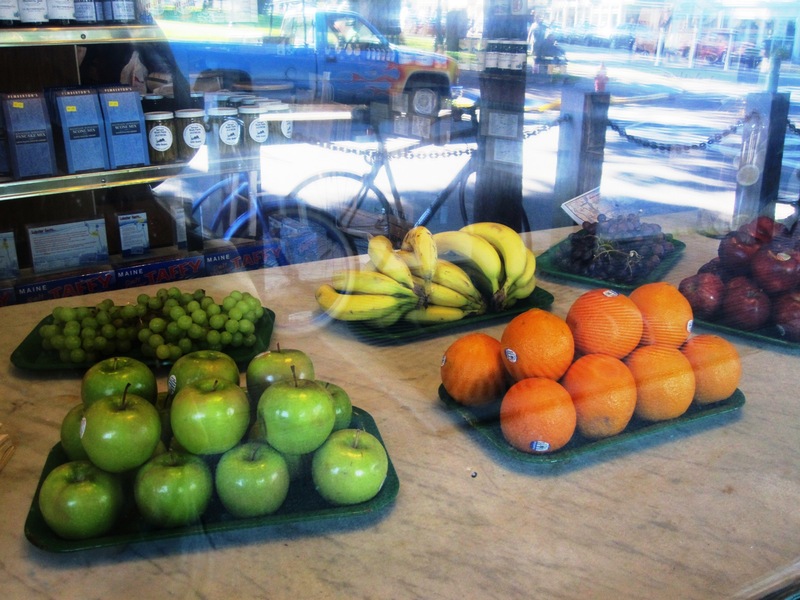 It’s a real old-fashioned shop that always has an eye catching display of fruit in the window. Stop in for your loaf of bread, a jug of wine and walk across the creaky wooden floor. You thought I was going to say thou, didn’t you? At the other end of town overlooking the harbor is this fountain. 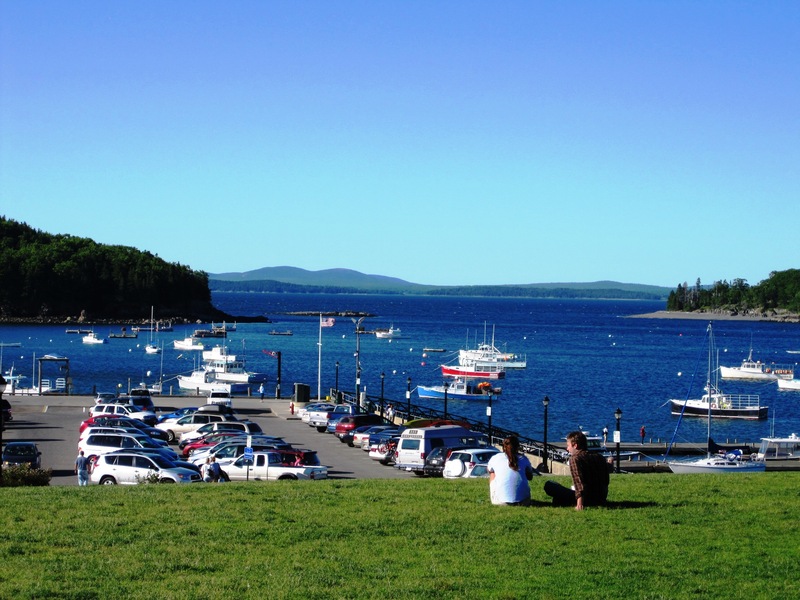 A favorite for children to splash in, you can sit here and watch the boats, cruise ships and whale watchers come and go. It’s also a favorite photo spot. 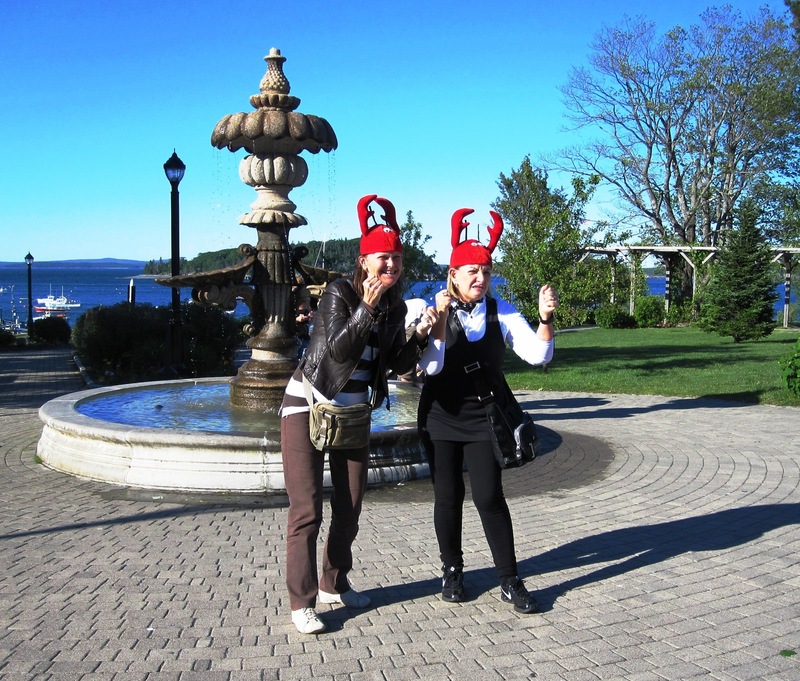 I caught these tourists having a fun time in their lobster hats. Not sure what they were trying to convey with their expressions though. 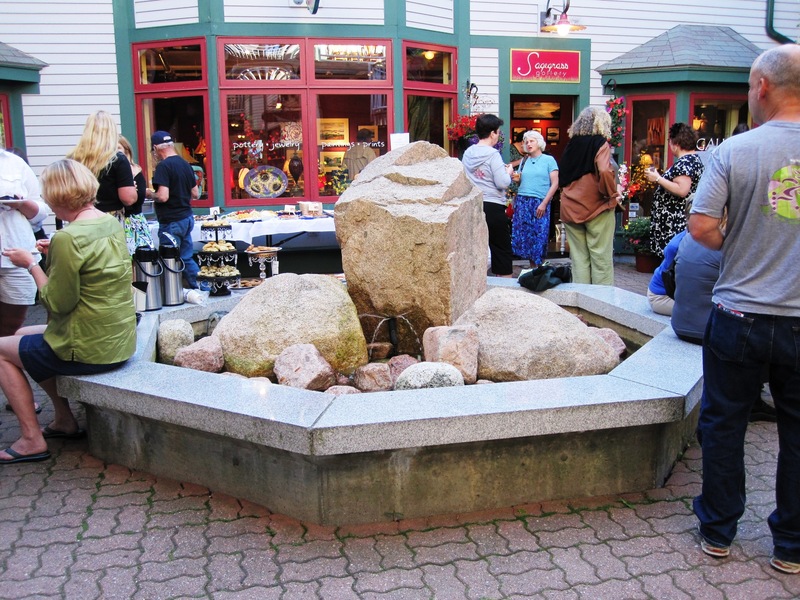 Down a short shopping courtyard you will find this fountain of native granite. Today there was a business-after-hours party going on sponsored by the chamber of commerce. It is a good meeting spot when friends and family get separated shopping and sight seeing. And it’s usually a cool and quite retreat on a hot humid day. Yes, it can get hot in Maine. It was 90 degrees there the day I returned to Seattle. 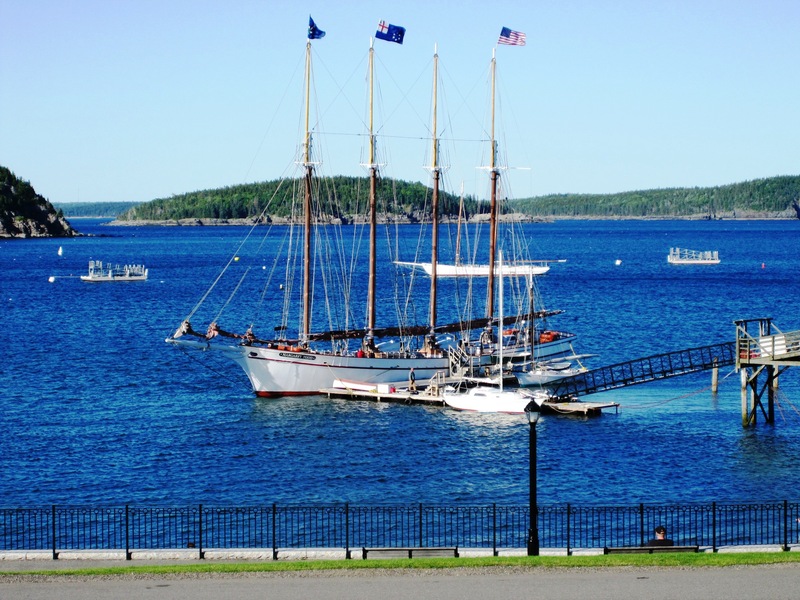 If it is too hot you can take a cruise on the Margaret Todd, a four masted schooner. You can even help hoist the sails and sing along to sea shanties. Or you can just sit in the park and people watch while enjoying the ocean breezes.